Some Google image searches produce more mixed results than others. 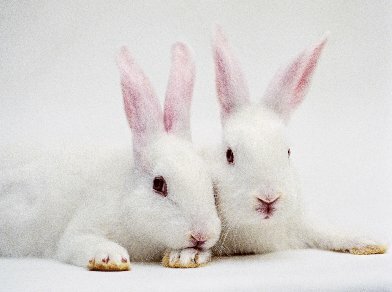 One of the subjects of today's post is White Rabbits--who if they were the two animals above as opposed to a rock band, would make me about as sick as I'm sure you all have been because I've gone several (to put it lightly) months without actually making a single explicit album recommendation in this space. While animal-based allergies are tough, they are no match for this so-called "career/full-time job" that insists on taking me away from both home and you. 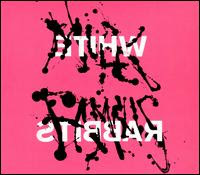 Milk Famous by White Rabbits : While there are all sorts of animal-related tie-ins I could make with the following statement, I'll resist the urge and just say it: This album is an evolutionary leap from their previous work. Without disparaging their previous work, this almost sounds like an entirely different band. From the rhythmic complexity of the sound collages to the ability to connect the kinetic to the catchy, White Rabbits latest work is a giant step forward for a band known for being solid to occasionally good. This album smacks of innovation with more than a few hints of greatness and was completely unexpected by a casual fan like me. While you'll read a million reviews that compare them to Spoon, I think it's now a lazy and outdated reference at this point. Take Spoon's most abstract work (which isn't THAT abstract) and you're only about half way to the challenging and layered rhythm found on Milk Famous. That is less a shot at Spoon (a band I love) and more of an eschewing of the common comparison--even if it's true that fans of Spoon will probably like White Rabbits. This is coincidence more than correlation. Zeroes QC by SUUNS: The most confoundedly addictive album I'm listening to these days--the 2010 debut full-length from Montreal's Suuns is full of adventure, experimentation and dark despair. This is not to say that it is a depressing record at all, but there is a clear layer of night and distance permeating every note of the record. Initially unmoved upon first listen, I've found myself returning over and over again to the sound lab that is Zeroes QC with the fuzzy guitars, the unrelenting robotic beats, and the myriad of otherworldly melodies. There's so much here to try and put a finger on, but I'd suggest just giving in and going along for the ride--no matter how foreboding it may initially appear. Bury Them All by Cheap Freaks: I'm almost certain that my friends are tired of me talking about this album, but my enthusiasm for this bluesy, impassioned rock 'n' roll gem from the Emerald Isle has yet to wane. Simply stated, this is the most refreshing, fun, and pure rock record I've heard in ages. With the occasional lyrical theatrics of bands like Grinderman or The Stooges, the grit of garage rock, and the unwavering energy of classic punk, Cheap Freaks are masters at owing their sound to none of these camps exclusively. The record never stops being infectious and rollicking and I can't imagine a scenario where it doesn't find its way to my year-end best-of list. Given a myriad of diverse options in today's musical landscape, sometimes we just need some rock 'n' roll that satisfies the urges and instincts of our guts. My friends, meet your highly potent remedy.